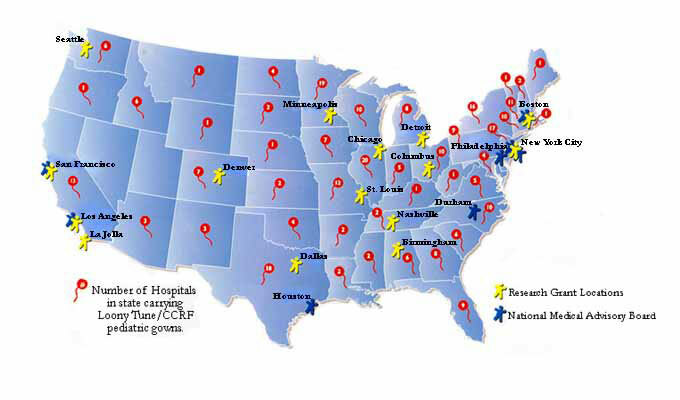 After 29 years of funding, CCRF has just awarded its 81st research grant! Since Children's Cancer Research Fund is not the arm of any one hospital, it is able to fund research on a national level. *Sestrins Modulate p53-Dependent Responses to Chemotherapy in Neuroblastoma. *Preclinical Assessment of Ctnnb1 Suppression for Treatment of MLL-AF9 AML/LSC. ROY, UPAL BASU, Ph.D., M.P.H. *Targeting Sox2-positive Stem Cells in Osteosarcoma. *Leukemia-Specific Ligands Against Childhood Acute Lymphoblastic Leukemia. *Role of IL-6/STAT-3 and AKT signaling in Neuroblastoma Chemoresistance and Tumor progression in Bone Marrow Microenvironment. *Immunotherapy to Target Cancer Stem Cells in Pediatric Osteosarcoma. *A Novel Chemotherapy (Romidepsin) and Immunotherapy (Natural Killer Cell) Based Approach in Pediatric Leukemia and Lymphomas: Potential for Targeted Adoptive Cellular Immunotherapy (ACI). *Volumetric Bone Mineral Density Changes During and After Childhood Acute Lymphoblastic Leukemia Therapy. *Overcoming Neuroblastoma Drug Resistance with Histone Deacetylase Inhibitors and Flavopiridol. MITTLEMAN, STEPHEN D., M.D., Ph.D.
*Exploring How Obesity and Adipocytes Affect Childhood Cancer. OKCU, MEHMET F., M.D., Ph.D.
*Glutathione S-Transferase P1 Variation and Survival in Children with High Risk Neuroblastoma. *Nuclear Factor I A gene, and Astrocytic Lineage Gene, in Glioma Formation. *Genomics of Metastatic Neuroblastomas Lacking MYCN Amplification. *Identifying Candidates for Targeted Therapy in Combination with FLT3 Inhibition for the Treatment of Acute Myeloid Leukemia. Bringham and Women's Hospital, Inc.
*EWS-Flil as an Immuno-Therapeutic Target for Ewing's Sarcoma. ARMSTRONG, MICHAEL B., M.D., PH.D.
*Impact of N-myc on Chemoresistance in Neuroblastoma. *Epstein-Barr Virus Immunity and Lymphoma. *Mer Receptor Tyrosine Kinase as a Biological Marker and Therapeutic Target for Pediatric Leukemia. *Acute Lymphoblastic Leukemia in Down Syndrome: An Investigation of Molecular Genetics and Host Toxicity. *Testing Novel Therapeutics in a Mouse Model if Inv (16). *Preclinical Evaluation of VEGFR2/EGFR Inhibition in Combination with MetronomicTemozolomide in a Mouse Model of High Grade Gliomas. HAINING, W. NICHOLAS, B.M., B.CH. *Targeting telomerase as a cancer antigen: a phase 1 pediatric tumor vaccine trial. *Role of pro-angiogenic factors in leukemia-stroma interactions. *The Identification of Novel Biomarkers and Therapeutic Targets in Pediatric ALL by Correlative Analysis of Genome Copy Number Alterations, mRNA Expression, and Clinical Characteristics. *Gene Expression Profiles of Metastic Neuroblastomas without MYCN Amplification Predict Outcome. *The antiangiogenic effect of alphav-integrin inhibition combined with fenretinide in mouse models of human brain tumors. *Development of immune therapy for ETV6-AML1 positive leukemia using a novel mouse model. *Genetic Polymnorphisms and Anthracycline Associated Cardiac Toxicity. BROWN, VALERIE I., M.D., PH.D.
*Evaluation of mTOR Inhibitors and the Role of IL-7 Signaling in Lymphoid Malignancies. GRAHAM, DOUGLAS K., M.D., PH.D.
*Evaluation of role of proto-oncogene c-mer in acute lymphocytic leukemia. *In Vivo Effects of Erythropoietin Receptor Signaling in Pediatric Tumors. *Activity of fenretinide (4-HPR) and 4-HPR plus safingol in preventing disease progression against pediatric Ewing's Sarcoma (ES) and Primitive neuroectodermal Tumors (PNET) cell lines In Vitro and In Vivo. *Role of Erythropoietin and Erythropoietin Receptor in Pediatric Tumors. *Methylation of the O6-methylguanine methyltransferase (MGMT) gene promoter as a prognostic factor in pediatric high grade glioma and medulloblastoma. *Combination Immunotherapy and Chemotherapy for Rhabdomyosarcoma. MAURER, BARRY J., M.D., PH.D.
*Novel Retinoid Combinations with Selective Cytotoxicity for Malignant Cells. *Molecular Basis and Clinical Spectrum of Rothmund-Thomson Syndrome. *In Vitro Drug-Induced Apoptosis as a Measure of Chemo-sensitivity in Childhood T-Cell Acute Lymphoblastic Leukemia. VAN TORNOUT, JAN M., M.D., M.S. *Evidence for Gene - Environmental Interaction(s) in the Etiology of Pediatric Brain Cancer. SWEETSER, DAVID A., M.D., PH.D.
*The Significance of Loss of Heterozygosity in the Patho-genesis and Prognosis of Pediatric de novo AML. *Evaluation of Apoptotic Oncoproteins in Blast Cells from Pediatric Patients with Leukemia at Diagnosis and at Relapse. *Resistance to Alkylating Agents in Neuroblastoma. *Retrospective Analysis of Prognostic Import of TEL Rearrangements and Hyperdiploidy on Treatment Outcomes for Children with Standard Risks ALL treated with a Single Delayed Intensification. *Analysis of Differentially Expressive Genes in Normal and Neoplastic B-Cells. *Expression of anti-CD 19 scFv/zeta Chimeric Gene in Human NK Cells. *Integrin Alpha-v Beta-3 in Angiogenic Signaling in Pediatric Neural Tumors. *The Molecular Basis of Cytarabine Sensity of Down Syndrome Children. *Testing the feasibility of using the PCR Technique to measure the presence of Ewing's Sarcoma or Peripheral Neuraoecto- dermal Tumors. HAMRE, MERLIN R., M.D., M.P.H. *Mechanisms of Resistance to Nucleoside Analogue Inhibitors of S-Adenosyl-L-Homocysteine hydrolase in Murine and Human Neuroblastoma Tumor Cell Lines: Enzymatic and Genetic Determinants. *Acquired and Constitutional Alterations of p53 in the Devel- opment and Progression of Childhood Central Nervous System Tumors. *Mechanisms of Response and Effectiveness of 13-Cis Retinoic Acid in the Treatment of Juvenile Chronic Myelogenous Leukemia. TOMLINSON, GALE E., M.D., PH.D.
*A Search for predisposition factors in Breats/Sarcoma Cancer Families. *The Biologic Effects of Down-regulation of N-myc Oncogene Expression in Human Neuroblastoma. *Mutations of the Neurofibromatosis and Ras Genes in Childhood Myeloproliferative Syndromes. *The Role of Classic Multidrug Resistance in Pediatric Solid Tumors. *Urokinase and It's Receptor in Pediatric Cancers - the Tumor Biology of Wilms' Tumor and Neuroblastoma, Development and Metastasis. *Isolation, Molecular Characterization and Induction of Differ- entiation of Mixed Lineage (Myeloid/Lymphoid) Precursors from Norman and Leukemic Human Bone Marrow. *Inhibition of N-myc Gene Expression with Antisense N-myc RNA. *Use of Ch14.18 and GM-CSF Neuroblastoma. VAN TORNOUT, JAN M.A., M.D. *The Use of Neural Networking in Pediatric Outcome of Childhood Cancer. TOMLINSON, GAIL E., M.D., PH.D.
*Constitutional p53 Mutations in Childhood Patients. SAYLORS, ROBERT L. III, M.D. *Vbeta Specificity of T-cell Leukemia and other T-cell Lymphoproliferative Disorders. *Significance of Cellular Proliferation in Neuroblastoma. *6-Mercaptopurine Metabolism in Children with Acute Lymphoblastic Leukemia. *Effect of L-Asparaginase on the regulatory coagulation proteins and vWF as a mechanism for thrombosis in children with leukemia and lymphoma.